Sugar Creek Elementary School provides Pre-K Early Childhood Education (serving children 3-5 years old) as well as Kindergarten through 5th Grade. It is located just over a mile away from FBC. In 2015, FBC began a partnership with Sugar Creek. First Baptist Church will be continuing our partnership with Sugar Creek School for the next school year. The needs of the school have been expanded to involve different grades within the school, providing some exciting new ways to provide service within our local community. Some activities do not require volunteers at the school, with work being completed at the church or taken home and returned. This teacher would like help throughout the school year; these are on an “as needed basis.” The teacher needs help copying and laminating materials at the school for materials to be used in the classroom. In addition, she has asked for assistance with cutting, gluing, preparing binders and other similar activities, which can be done at church as a group activity or at home. Arrangements will be made to pick up materials at the school to prepare at church or at home. 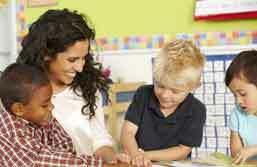 Needs help with small group instruction during a guided reading time on Wednesday and Fridays from 10:20 to 10:50 a.m. Teacher would like a person to help one day a week with hang things up, making copies, working one-on-one with different children on an occasional basis; this could be any day of the week. The teacher would like to have volunteers during Reading Workshop on Wednesdays or Thursdays from 12:15-2:30 p.m.
Volunteer(s) to provide one-on-one reading or math with students. Additional volunteer needed for a limited amount of collating and stapling. Please prayerfully consider this opportunity to work with the youngest children within our community or assist with helping teachers direct their efforts toward teaching, while we provide the work compiling the teaching aids for use in the classrooms. If you are interested in supporting SCES outreach, please contact Sandi Barlow or sign up on the volunteer sheet located in Barker Hall. Individuals volunteering at the school are required to complete a background check before going on-grounds to work in the classroom settings. Sandi will provide a link to use for all background checks. Alternatively, consider our online giving option as a means of support for Sugar Creek Elementary or any of our other missions.